Computers have revolutionized the way we learn and communicate. The practical applications of technology and computer systems are extensive and always growing. 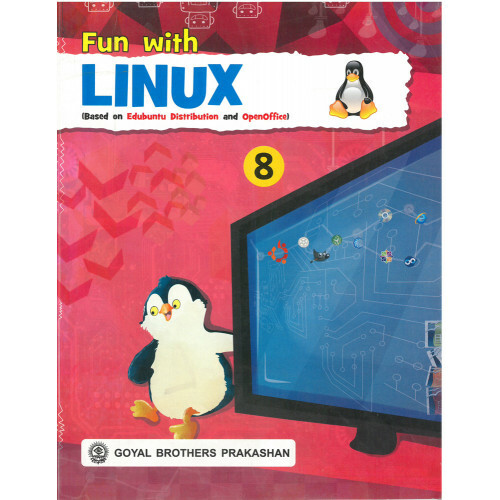 Keeping this evolving computer world in mind we have prepared the series Fun with Linux for Classes 1 to 8. It is specially designed for providing a vast theoretical and practical knowledge of computers to the students. It is the most comprehensive series in which activity and tool based approach has been followed. Each chapter in the series starts with an engaging introduction followed by an activity based approach to learning, which is supported with ample number of diagrams, pictures and relevant screenshots. The exercises in each chapter have sufficient practical and activity based questions. This series is based on Edubuntu Distribution and OpenOffice. CD, Web Support and Teacher's Resource Book are available with the entire series. Learning Objectives : Describe the goals required to be achieved by the end of the chapter. Chapter Contents : Starts with an engaging introduction with Practical and followed by Activity based approach to learning. The text is supported with diagrams, pictures and relevant screenshots. Read More : Gives extra and useful information on the topic being covered. Do and Learn : Provides activities that help in learning the concept being taught. Shape Your Mind : Includes Objective and Subjective Exercises to evaluate the knowledge. Learn with Fun : Contains Knowledge and Application based questions to check the progress of the students. In the Lab : Gives instructions to the students for performing various tasks in the lab. Students Activities : Encourage the students to explore more information on the topics learnt. Online Links : Provides various web links that encourage the students to explore information. Project Work : Assigns various tasks that challenge the students to apply the concepts learnt. Worksheets : Worksheets to evaluate knowledge and understanding of the students. CD : Provides animated topics to explain content and interactive exercises to check the understanding of the concepts learnt. Web Support : Offers various practice material for the students and teachers. Teacher's Resource Book : Contains teaching hints for explaining concepts and answers to the textbook exercises.